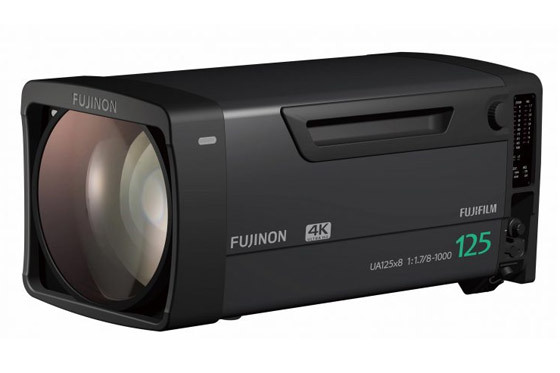 With NAB getting closer the new product releases are coming in thick and fast so this blog covers Canon, FUJINON, and Atomos. More dedicated blogs on individual manufacturers and products will be released later. Pre NAB Canon has just announced 5…that’s right 5 new camcorders and seven new lenses in their new Sumire Prime lens series. The basic specs and benefits are below; a video will be released soon via our News In 90 seconds YouTube channel. 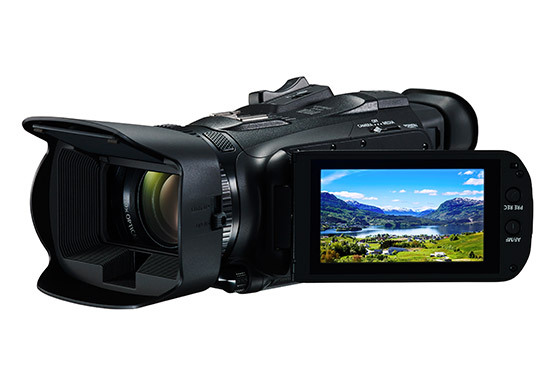 This new series of UHD 4K camcorders comprise of the XA40 which has a 1 2/3" CMOS sensor and the XA50 and XA55 which both have a 1” CMOS sensor. The other specs between the 3 models are very similar. 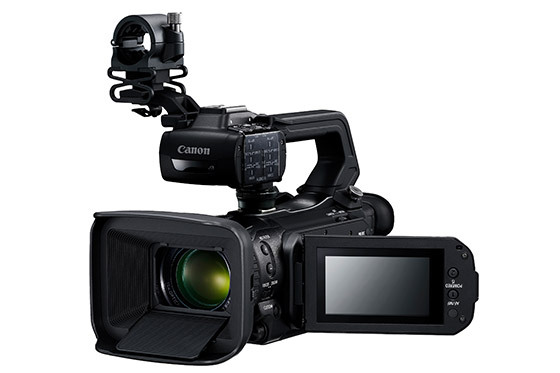 They all offer optical zoom, 4K recording, higher quality oversampled HD images and XLR audio inputs. 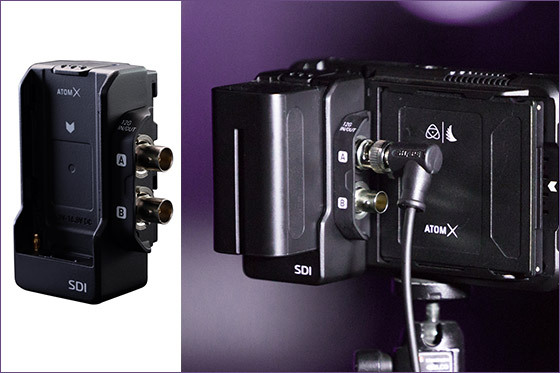 The XA50 and 55 are very similar apart from the additional 3G-SDI connectivity on the XA55. Along with the XA55 the XA50 has Dual Pixel and Contrast autofocus, fast- and slow-motion recording, full manual control, optical and electronic image stabilization, a 3" touchscreen LCD and user-assignable buttons. They record XF-AVC and MP4 formats onto duel SD card slots capturing XF-AVC 4K UHD 160Mbps up to 25P, plus Full HD 45Mbps at 50P/50i/25P. They both feature a built-in stereo microphone as well as a headphone jack. The camera's functions can also be controlled by the separately available RC-V100 remote control. 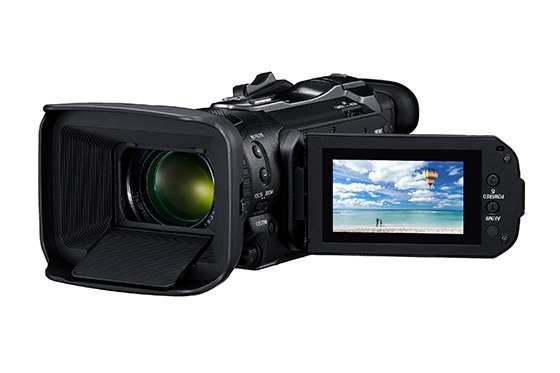 The XA50 and 55 are very similar; the only real difference is that the XA55 has 3G-SDI connectivity. So same sensor, optical zoom range, recording capabilities etc. 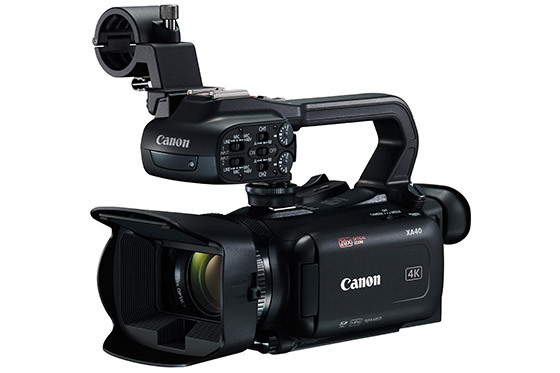 The XA40 is small and lightweight camcorder, it records 4K, has a 1/2.3" sensor, 20x optical zoom, two XLR audio inputs, and one mini-HDMI output. 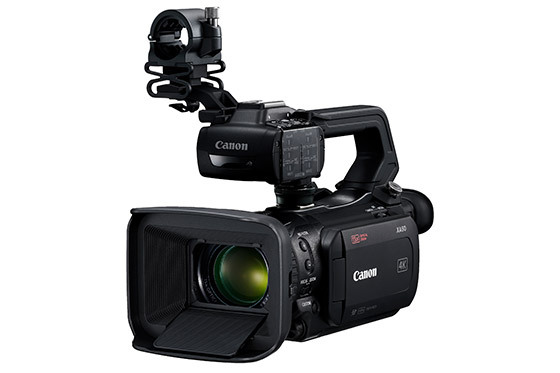 Aimed more at the consumer market the HF G50 and HF G60 are the two new LEGRIA camcorders from Canon. Both models record 4K and the only major difference is the sensor size. The HF G50 has a 1/2.3" CMOS sensor and the HF G60 a larger 1" sensor. Canon has just released the new Sumire Prime lens series which features 7 lenses. What makes these different ? well for a start they are shipped with a PL mount ! That’s big news because this is the first time that Canon has done that. Why did they do it ? well having a PL mount means they are not only compatible with their own cine cameras the EOS C700 FF, EOS C300 Mark II and EOS C200 but with cameras from other manufacturers such as ARRI, Sony, BlackMagic and many more. The full set comprises of the CN-E14mm T3.1 FP X, CN-E20mm T1.5 FP X, CN-E24mm T1.5 FP X, CN-E35mm T1.5 FP X, CN-E50mm T1.3 FP X, CN-E85mm T1.3 FP X and CN-E135mm T2.2 FP X. They have been design to give a ‘cinematic look’, with fast T-number due to its large lens diameter and an 11-blade iris delivering richer levels of bokeh. All lenses accept 105mm screw-on filters, have a 114mm diameter lens front and have consistently positioned gears for ease of use. As for availability and price the CN-E24mm T1.5 FP X, CN-E35mm T1.5 FP X, CN-E50mm T1.3 FP X and CN-E85mm T1.3 FP X will be available this summer followed by the CN-E14mm T3.1 FP X later in the year, with the CN-E20mm T1.5 FP X and CN-E135mm T2.2 FP X at the end of 2019 or early 2020. Pricing has yet to be confirmed. 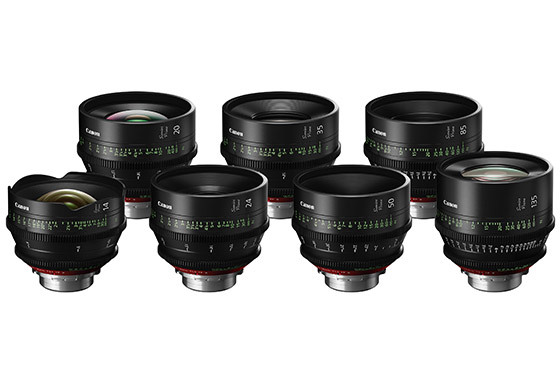 These are dedicated Cine zooms for large format cameras such as the Alexa Mini LF, Sony VENICE etc. 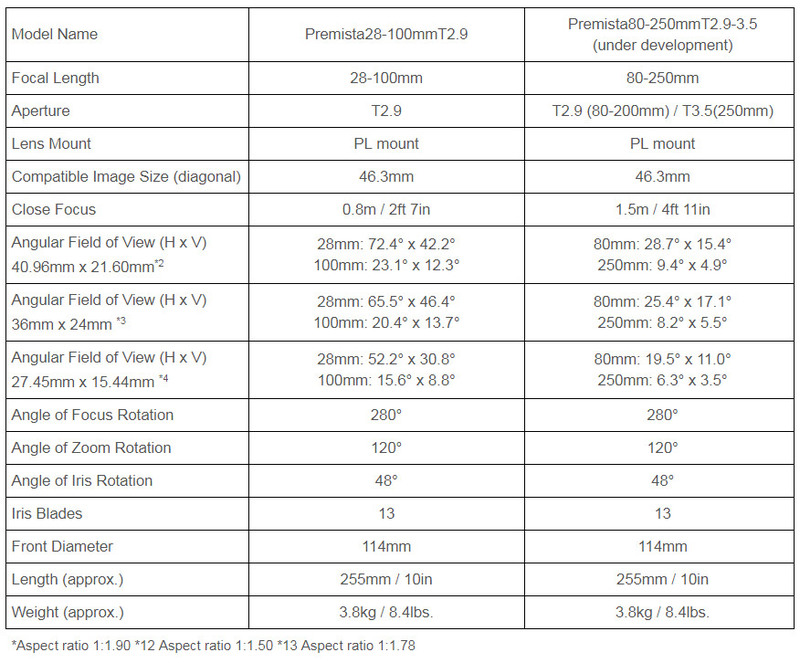 The first Premista 28-100mm T2.9 is going to ship this summer to be followed by the 80-250mm later in the year. They cover the most frequently-used focal lengths from 28mm to 250mm and the 28-100mm has a constant T2.9 speed across the entire zoom range. With a minimum image circle of 46.3mm they provide full coverage for all of the current large format digital cinema cameras available! 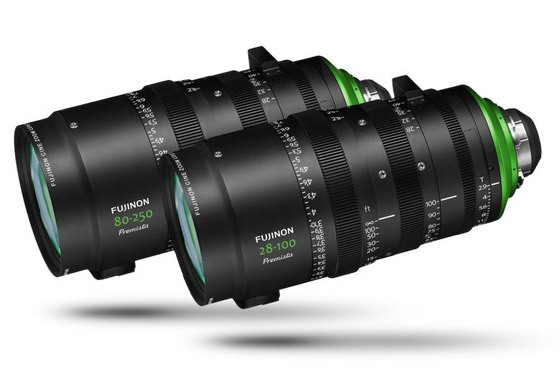 In addition to the Premista series FUJINON has also announce three new 4KUHD lenses which will be launched at the NAB Show next week! The UA125x8, UA18x7.6 and UA23x7.6. The new UA125x8 is a studio box lens with a 125x high magnification zoom that covers an incredible focal range of 8mm to 1000mm with an F1.7 aperture. !! 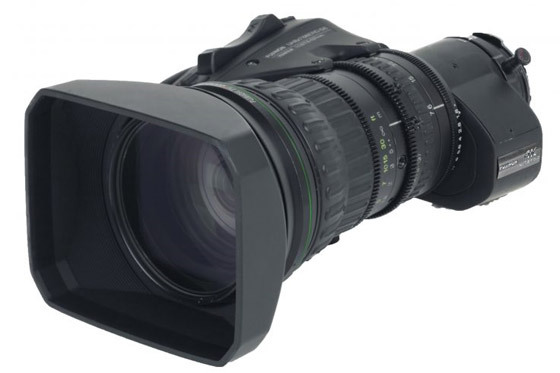 That makes it the longest and widest 4K lens for Ultra HD applications that Fujinon make. Similar to other lenses in the UA Series, the UA125x is designed for 4K UHD capture from today’s latest 4K 2/3″ Ultra HD cameras. The UA125x8 employs the latest High Transmittance Electron Beam Coating (HT-EBC) resulting in richer colours and greatly improved blue response and transmittance. HT-EBC, coupled with Fujifilm's exclusive Aspheric Technology, reduces ghost and flare, and increases light transmission. A proprietary anti-fogging design minimises lens fogging and reduces downtime due to moisture—a critical concern when shooting in all types of weather conditions. The new UA18x7.6 is a compact and cost-effective handheld zoom lens designed for a range of applications, including sports and entertainment production. It features a 7.6~137mm focal length plus a 2x extender with a constant aperture of F1.8. It is relatively low weight tipping the scales at 1.58kg (3.5 lbs). 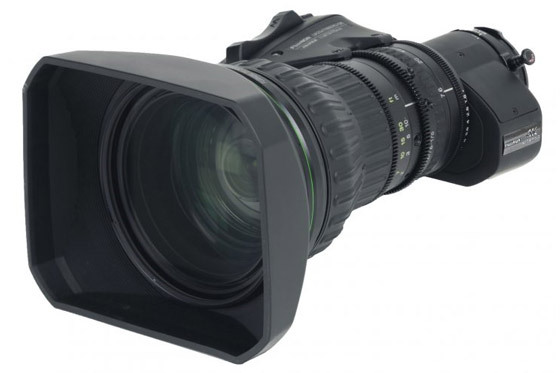 The UA23x7.6 is an economical 4K telephoto zoom for studio and field production. It has a focal range of 7.6~175mm plus a 2x extender with an aperture of F1.8, and weighs just 4.2 lbs. Both the UA18x7.6 and UA23x7.6 lenses have HT-EBC coating, as well as the same HDR and 2/3-inch 4K performance as the UA125x8. Atomos announced a new AtomX accessory addition to their growing line-up of expansion modules for their latest generation monitor/recorders. The new AtomX SDI module adds SDI connectivity to the Ninja V with 4K/60p support. The SDI module is priced at around £170 plus VAT and is expected to ship next month. The AtomXSDI module is about the size of a NP type battery and docks neatly into the rear of the Ninja V via the modular expansion port. It adds two user-configurable 12G SDI ports with reliable, industry standard full-sized 75 Ohm BNC connectors. Either port can be set up to transmit or receive signals at up to 4Kp60 or 2Kp240. The AtomX SDI module turns the Ninja V into a versatile 5-inch SDI and HDMI monitor-recorder. Its recording capabilities, monitoring tools and high brightness 1000nit 1920x1080 HDR screen can now be used with a wide variety of broadcast, cinema and professional cameras, plus other SDI sources. 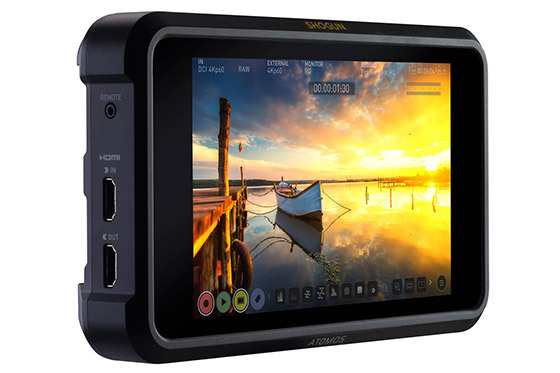 Atomos have just released what they believe will be the next generation of on-camera field monitors…the SHOGUN 7 ! This is taking multi functions to the extreme as it can happily work as a stand-alone field monitor, recorder and switcher in many applications from live events to documentaries. Unbelievably It can record up to 5.7K resolution recording, up to 4K 120fps and 2K 240fps for super slow motion action in ProRes RAW (dependant on camera capability). The Shogun 7 retains the same solid features of the Shogun Inferno with a large 7.2" screen, 1500 cd/m2 brightness, Rec. 709 monitoring, a 10-bit FRC screen with Dynamic AtomHDR technology and native Log support etc. In addition it supports simultaneously monitoring, recording, and switching between programs and up to four HD-SDI camera streams. The Atomos Shogun 7 features a new 7" industrial design in-line with the Ninja V and supports two NP-F batteries, DC input and records to removable 2.5" SSD media. It comes with one Master Caddy II, a 12V power supply, and a hard case to protect your gear during transport and storage. 1500nit HDR Display incorporating 360-zone technology with 1,000,000:1 contrast ratio, 15+ stops of dynamic range and 105% DCI-P3 Wide Colour Gamut. Real-time recording to 4K formats including ProRes RAW, CinemaDNG, ProRes and DNx. New Dolby Vision HDR Output in real-time, direct from camera sources. New Dynamic AtomHDR Backlight advanced image processing system. Portable Multi-Cam HD Recording supporting 4x ISO feeds over SDI up to 1080 60p with live asynchronous switching. AtomOS 10 touch-screen interface first seen on the award-winning Ninja V.